Masqualero is a versatile typeface created by Jim Ford and published by Monotype which is available in 6 weight (from Light to ExtraBlack) and their italics, plus Stencil & Groove style, a lot of OpenType features and languages support. Designed to be suitable for applications, it works great editorial use, advertising, branding etc. 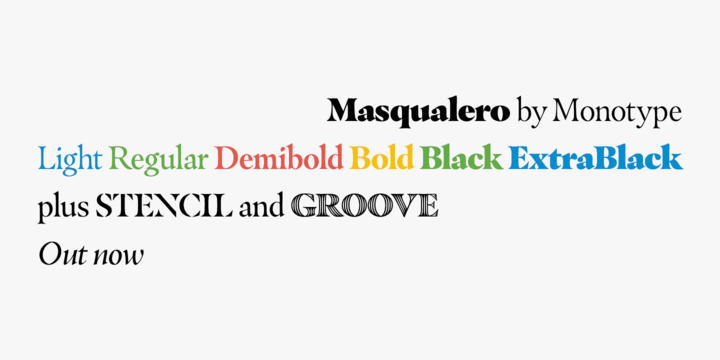 Enjoy your new type, Masqualero! Note: “Masqualero” is a trademark of Monotype Imaging Inc. and may be registered in certain jurisdictions. Price: starting from $49 for one font to $199,90 for all 14 fonts. A font description published on Wednesday, March 29th, 2017 in Fonts, Jim Ford, Monotype by Alexandra that has 3,506 views.